We know there are huge benefits to patients, the public and health and care services if people are at the heart of the care they receive. To achieve this, one element that is crucial is the importance of finding and using the right words that help build a meaningful connection between people and their care givers. 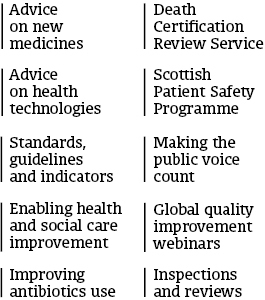 SIGN, part of Healthcare Improvement Scotland, produces guidelines for health and care professionals in Scotland on the best treatments that are available for a range of conditions, including asthma, heart disease, various forms of cancer, ADHD and a number of mental health conditions. Recently, we produced information for people living with Coronary Heart Disease (CHD) or who are at risk of CHD. Our information sought to inform people about their condition and empower them to take responsibility for aspects of their health. Patient versions of guidelines can act as a discussion aid to promote shared decision-making. Whether a person has autism or is being treated for a heart condition, people want to know that they have all the necessary information to make decisions about their care. Without support from accessible and reliable health information, it’s almost impossible for people to understand and take part in shared decision-making. In 2016 we produced an advice booklet for children and young people on assessment and treatments for autism, a lifelong condition causing difficulties with social and communication skills and behaviour. We heard from young people with autism to make sure their views were reflected in the advice. We visited schools and spoke to young people about their experiences of living with autism. They also told us it was the first time they had ever been asked what they thought! The more patient versions of guidelines we produce the more it becomes apparent just how important it is that the advice is understood by everyone involved. Health and care professionals increasingly request copies of these booklets for their clinics and patient groups order them for their information packs. I would like to say a big Thank You to all those who take the time to tell us exactly what they think, who let us know what it’s like to be them and help us to connect meaningfully. Together we’re shifting the focus of care from what is done to patients, to what happens in collaboration with them – with meaningful words at the heart of the bridges we build. To read our patient-friendly advice on a range of conditions, visit our website www.sign.ac.uk. Karen Graham is Public Involvement Advisor at the Scottish Intercollegiate Guidelines Network (SIGN), part of Healthcare Improvement Scotland. I do so agree that the right words are crucial to empower patients and the public. Are Healthcare Improvement Scotland sure that “THINK Frailty” are the right words to empower our older generation? Has HIS properly included our respected elders in implementing this language nationally across the NHS? I think there are several important things to say here and a common misunderstanding. Firstly, the misunderstanding is that frailty is seen as a label. It is not a label but a diagnosis and precision around this is vital. We have had a similar fight to get the language right for delirium and are now seeing the benefits. Frailty represents a risk of acute dependence or death in the context of an acute illness. It therefore represents an opportunity to intervene and prevent harms. Getting the diagnosis correct for frailty is important. A recent trial showed that if GPs were given a diagnosis of frailty for their patients, they were more likely to make appropriate tailored treatment plans for that patient. Evidence is overwhelming that correct treatment for frailty (comprehensive geriatric assessment) reduces long term dependence and institutionalisation and potential mortality. Identifying the right patients to target best care to is essential. You are correct in suggesting that older people find a diagnosis of frailty difficult. Other diagnoses such as cancer and dementia are similarly difficult, but we cannot avoid an honest discussion with our patients. We owe that to them. Care does need to be taken to be accurate and careful with diagnosis, and in the ‘living well’ teams we are making every effort to get accurate and reliable tools into the hands of clinicians. In fact, we have taken a long time to ensure the rigorous evaluation in a Scottish context of tools such as the eFI. We are now working with teams to test the response to the tool. I am most grateful for your response on behalf of Healthcare Improvement Scotland. It does indeed help for there to be an open sharing of views. It is clear that we both share the determination to see the older generation live as well as possible. I am always concerned about national approaches which may be perceived as ‘top-down’ but particularly where the patient group has not been fully involved. There is now growing medical literature on frailty which examines the need to include considerations of assets as well as deficits. I have been interested for a long time in considerations of the language used in relation to medical diagnoses particularly in relation to risks of reductionism and stigma. I do not think that we have always got this right and it is important to maintain open minds for potential unforeseen consequences. We both, as NHS doctors, will use rating scales and other tools on a regular basis and so have an awareness of their strengths and limitations. My concern remains about the increasing reliance that Healthcare Improvement Scotland is putting on such tools or toolkits (perhaps at the expense of comprehensive geriatric assessment). The language in itself suggests that we are dealing with mechanical failures rather than with our fellow humans.